Meet chook (almost!! ), which I have been knitting for Mr P.
It was meant to be a Christmas present, then a birthday present, and now, probably an early Easter gift! *I wonder if Mr P is going to wake up soon. *I really like this wool, though the colour is a little bright. *Claire liked the colour, she has some too. *I wonder what Claire will make with one ball. *I wonder if I should put a sand bag into the chook to make it like a front door stop instead? *Oh then Mr P might weild it at someone! *Do I actually rememeber his face or just the photos? *Should I put the kettle on? *What do I feel like drinking, it is a bit hot. *I should text B up in Brisbane and tell her it is warm. *I should take a photo of this chook and put it on my blog, even though it hasn't yet got a head. 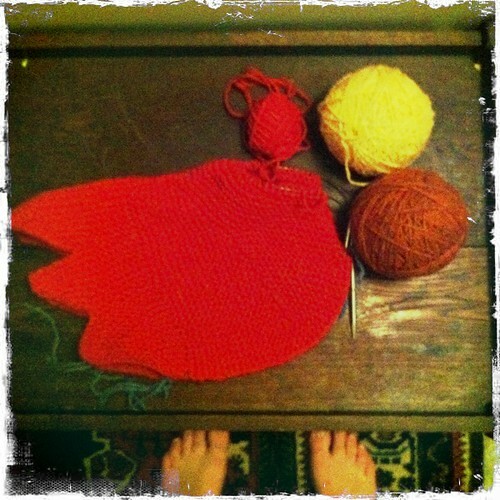 Not quite Zen and Art of Knitting... and, no wonder it has taken me so long! My mind is one headless chook!